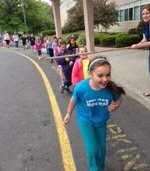 Wakelee celebrated it's annual Walk-a-thon this afternoon. Students got plenty of exercise by walking around the building, dancing to music, and attempting to avoid the limbo stick. The fundraiser was a success, raising over $4,000 for the Wakelee PTO.